Read or modify an object’s properties. Specify a method of action to be used with an object. With literally thousands of properties and methods available, you can easily be overwhelmed. Just remember, you’ll never need to use most of the available properties and methods. Examine the current setting for a property. This message box displays a Range object’s Value property. By the way, MsgBox is a very useful function. You can use it to display results while Excel executes your VBA code. 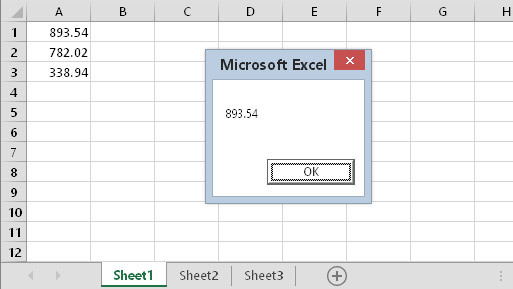 After Excel executes this procedure, cell A1 on Sheet1 of the active workbook contains the value 994.92. If the active workbook does not have a sheet named Sheet1, the result of executing that macro is an error message. VBA just follows instructions, and it can’t work with a sheet that doesn’t exist. Each object has its own set of properties, although some properties are common to many objects. For example, many (but not all) objects have a Visible property. Most objects also have a Name property. Some object properties are read-only properties, which means that your code can get the property’s value, but it can’t change it. In addition to properties, objects have methods. A method is an action you perform with an object. A method can change an object’s properties or make the object do something. Some methods take one or more arguments. An argument is a value that further specifies the action to perform. You place the arguments for a method after the method, separated by a space. Multiple arguments are separated by a comma. Notice that the worksheet reference was omitted when the Range objects were referenced. This can be done safely because a statement to activate Sheet1 was used. (using the Activate method). Notice the little prompt as the statement is being typed. That prompt shows the official name of the argument. The VBE displays a list of arguments while you type. As you may expect, this statement creates a new workbook. In other words, it adds a new workbook to the Workbooks collection. After you execute this macro, a fresh workbook will be the active workbook. There is one more topic that you need to know about: events. Objects respond to various events that occur. For example, when you’re working in Excel and you activate a different workbook, a Workbook Activate event occurs. You could, for example, have a VBA macro that is designed to execute whenever an Activate event occurs for a particular Workbook object. Excel supports many events, but not all objects can respond to all events. And some objects don’t respond to any events. The only events you can use are those made available by the programmers of Microsoft Excel.